Reflexite V98 Conformable Prismatic Reflective Rolls 24" 18" 12"
Our Products >> Sheeting Compatible with Vinyl Cutters >> Reflexite V98 Conformable Prismatic Reflective Rolls 24"
Reflexite V98 Conformable Prismatic Reflective Rolls 24"
Reflexite V98 Conformable Prismatic Graphics Film 24" wide rolls. Available in 10 foot and 50 foot rolls. 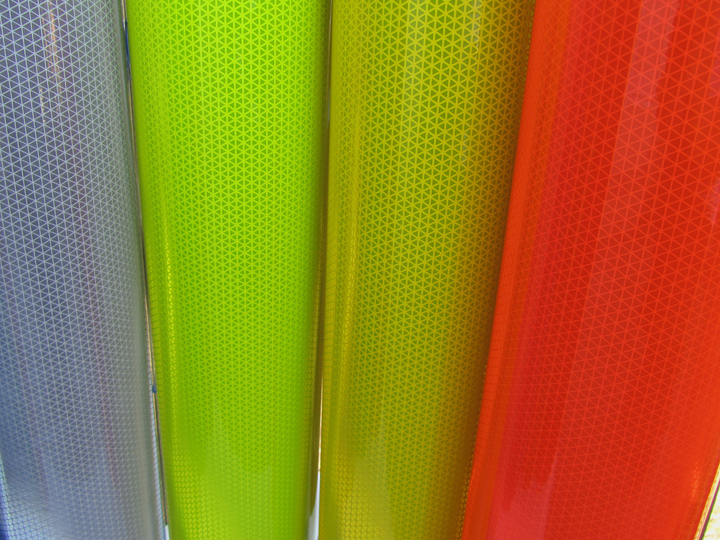 This material is specifically made for vehicle graphics but can be used for a variety of other applications. Perfect material for cutting graphics on a plotter. 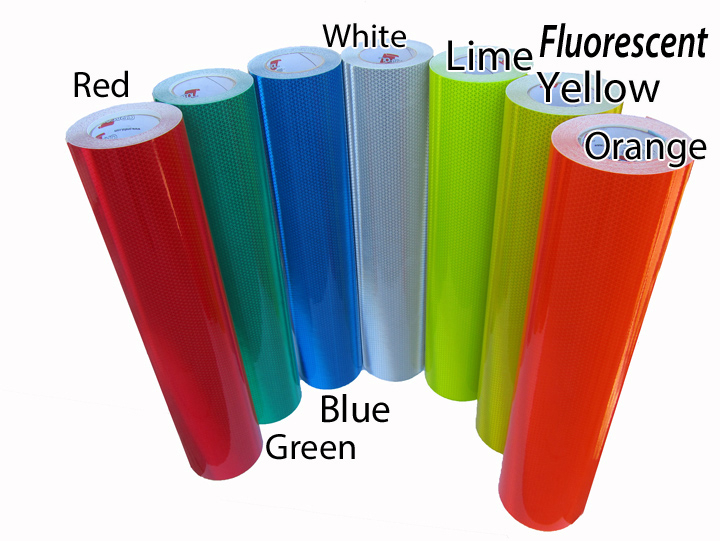 We carry red, green, blue, white, fluorescent lime, fluorescent yellow and fluorescent orange. This material is slightly thicker than our V92. About as thick as a business card. 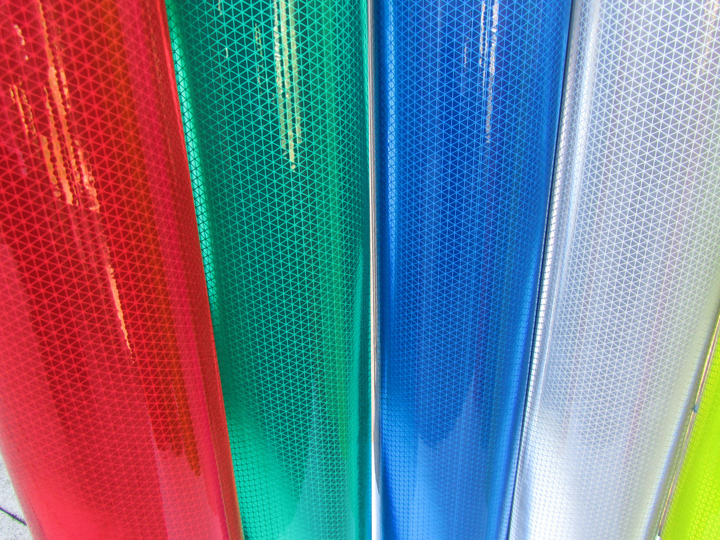 V98 prismatic reflective sheeting is the most advanced material for vehicle graphics on the market. It is conformable, repositionable, very tough and extremely bright. It is also the easiest prismatic material to plotter cut. I use a 60 degree blade and moderate pressure. Reflexite V98 is a weather and solvent resistant microprismatic retroreflective sheeting designed for rugged outdoor use on the sides and rear of trucks, trailers, school buses, farm equipment, automobiles and all types of mobile and industrial equipment. It is a conformable graphic sheeting composed of cube corner (microprism) retroreflective elements integrally bonded to a flexible, smooth surfaced tough and weather resistant UV stabilized polymeric film. The prism surfaces are coated with a vacuum deposition of aluminum to provide a mirror surface to the prism facets. The resulting material is not more than 0.018” thick, and comes with an aggressive high-tack pressure sensitive adhesive. V98 has a repositionable adhesive that once installed, builds adhesion over time. To apply you simply peel and stick to a clean, dry surface. The material has the ability to conform over mild compound curves. Heating with a hair dryer softens the material and enhances its ability to conform. V98 conformable prismatic reflective sheeting is 7 times brighter than standard engineer grade tape. Light is reflected via micro prisms making the tape much brighter than glass bead type tapes. This allows the tape to be seen from thousands of feet away versus hundreds. Reflexite V98 sheeting carries a 5-7 year outdoor rating. It is easy to handle and resists chipping and cracking. Available in Red, Green, Blue, White, Fluorescent Lime, Fluorescent Yellow and Fluorescent Orange.